356 glaciers tumble into icy blue lakes in Argentina's most famous park. Hikers flock here to explore the Fitz Roy massif, thrill-seekers sail up to the wall of Perito Moreno Glacier. Others seek the solitude and long sunsets of remote estancias, where the views stretch for miles and the only sound is the wind rustling across the pampa. As the name of the park suggests, Los Glaciares is home to a large number of glaciers; in fact, there are 356 of them! Perito Moreno is the most famous and accessible glacier in Patagonia, and one of the few on which you can ice hike. It feeds down from the ice cap into Lago Argentino, and accessed via El Calafate. Named after the Argentinian explorer Francisco Moreno, Perito Moreno Glacier stretches nearly 20 miles long and is one of the only advancing glaciers in the world. There are several other glaciers feeding into Lago Argentino in the south of Los Glaciares National Park, most notably Upsala and Spegazzini, which can also be visited by boat from El Calafate. Further north, Viedma Glacier is an impressive and active glacier feeding the large Viedma lake which is accessed from El Chalten. 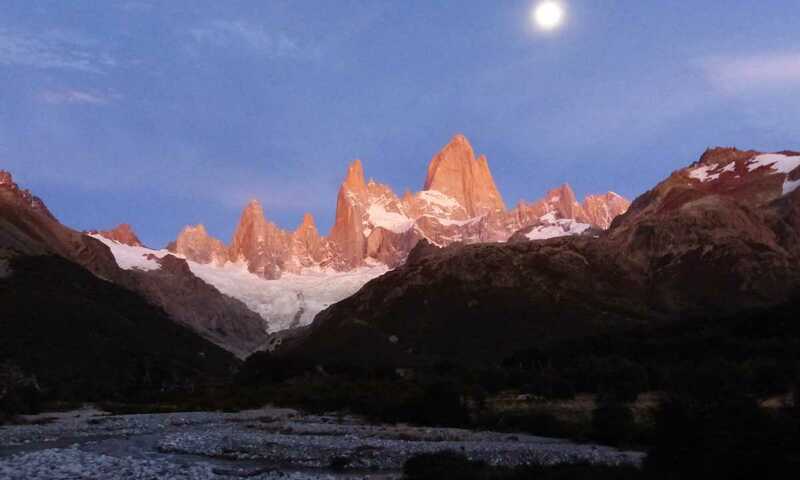 Numerous less famous glaciers, including Torre and Piedras Blancas, can be seen when trekking in the Fitz Roy region. The peaks of Los Glaciares National Park are what makes trekking here world famous. At the northern end stand the famous jagged granite peaks of Mount Fitz Roy. This mountain was initially named Chalten ('peak of fire') by the indigenous Tehuelche people, but was later renamed after Captain Fitzroy, who captained the ship on which Charles Darwin arrived here in 1834. Cerro Fitz Roy is notoriously difficult to climb and is only climbed around once a year. Another distinctive peak is Cerro Torre. Slightly less famous than Fitz Roy, it is just as difficult to climb, and is an imposing presence on the skyline. The Laguna Torre day hike from El Chalten takes you right up to the foot of the peak. The two huge lakes in the national park are both fed by glacial meltwater, giving them a milky blue colouring which makes for gorgeous photos against the glacial backdrops. Near El Chalten in the north is the smaller of the two, Lago Viedma. 80km in length, it is famous for the scouring effect the receding Viedma Glacier has had on the surrounding landscape surrounding. To the south is Lago Argentino, the largest lake in Argentina at an impressive 600 square miles. It is fed by waters from its northern neighbour via La Leona river, but also by the Perito Moreno, Upsala and Spegazzini glaciers. Its waters flow into the Santa Cruz river than ultimately empties into the Atlantic Ocean. El Calafate is the only big town in the area. With its large airport and good transport links it is the gateway to Los Glaciares, but a day is enough to explore what it has to offer. El Calafate's one main draw is the Perito Moreno Glacier, just over an hour away and well worth a visit. The main trekking opportunities lie 3 hours north in the Fitz Roy range, around the smaller town of El Chalten. El Chalten is a quirky mountain town close to Fitz Roy, and on a clear day, the peak dominates its skyline, which is why the town was given the old Telhueche name of the mountain. The town is very small and predominately caters for tourists, but there are some lovely little bars and restaurants to put your feet up in after some hard days hiking. If you're keen to don an ice-axe, crampons and snowshoes and aching to get deep into the Patagonian wilderness, then the ice cap is for you! The South Patagonian Ice Cap is part of the larger Patagonia Ice Sheet, and stretches over 400km north-south, around 40km east-west and is over a kilometre deep in places. It covers four national parks, including Los Glaciares, and remains unexplored in some areas, It is still also something of a 'border issue' between Chile and Argentina. Most expeditions begin or include the Marconi Pass or Paso del Viento, and expeditions typically take a minimum of 8 to 10 days. The main trails are well-trodden for a reason and you'll get spectacular views wherever you go, but the best sunrises and sunsets await those who get a little off-the-beaten-track, and camp out for a night or two among the mountains. From outside of Patagonia, you first need to get to Buenos Aires, from where you can take one of the 3 daily flights to El Calafate (3 hrs). Torres del Paine: Cross the Chile/Argentina border by land, roughly a five-hour drive. Aysen: Cross Lago O'Higgins/San Martin. Lake District: You can either fly between El Calafate and Bariloche (BRC) in the Argentinian Lake District, or take a road trip. Tierra del Fuego: Fly between El Calafate and Ushuaia (USH). Visit our flights page to find out more about travelling to and around Patagonia. 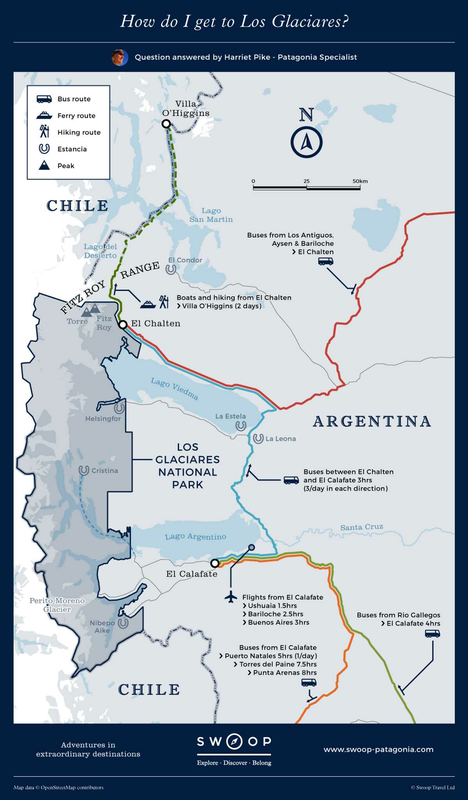 How do I get to Los Glaciares? A wonderful experience which far exceeded our expectations with spectacular scenery and events. There is a decent selection of hotels in and around El Calafate, including luxurious lodges, which tend to be further away from town, and mid-range hotels which are often more centrally located. El Chalten is a fantastic base for trekking in the area around Mount Fitz Roy. Although it is a very small town, it has a good range of hotels and hostels, as well as bars, restaurants, and shops for buying or renting trekking gear. If you're looking for something more comfortable or inclusive, then lodges and estancias are the best options for staying in Los Glaciares. An estancia is a traditional Patagonian farm, many of which now offer accommodation to visitors. Estancias are usually located in more remote areas and they have a homely and welcoming atmosphere. Marvel at the enormous electric blue Perito Moreno Glacier. hike the iconic trails of the Fitz Roy Range for stunning views then relax and enjoy the chocolate shops and craft beer in the charming mountain town of El Chalten. This is the classic way to experience Los Glaciares and is one of our most popular trips. You can combine this with ‘Classics’ in other parts of Chile and Argentina to tailor your 2-3 week holiday. The image of Fitzroy at sunrise beaming shades of pink, orange and yellow in front of me as I sat on a rock at the edge of a stream, is forever etched in my memory. How do I see the glaciers? You can see the glaciers in the north whilst out on treks from El Chalten. If you want to get up close, you can ice hike on Perito Moreno Glacier, or take a boat trip right up to its icy face. Where can I trek and mountaineer? 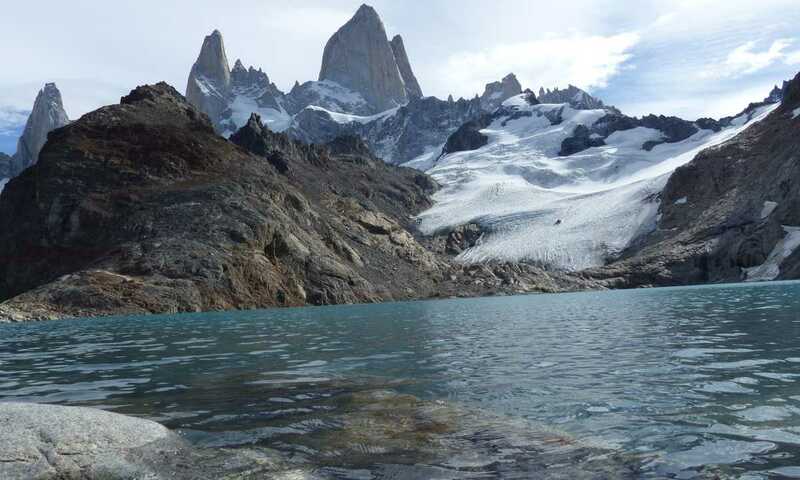 The best place to go trekking in Los Glaciares National Park is the Fitz Roy & El Chalten area. Here there is a wide range of trekking options, from gentle day-hikes to multi-day treks over mountain passes, to expeditions onto the South Patagonian Ice Cap. The best time to visit Los Glaciares is in between the end of spring and the start of autumn, which in the southern hemisphere is roughly from November through to April. Whatever time of year you visit Patagonia, you will find that the weather is very changeable, but avoiding the winter months will mean that there is a higher chance of being able to do the activities that you want to do. Can I combine Los Glaciares with Torres del Paine? Yes, it's possible to explore both great regions taking in Fitz Roy massif in Los Glaciares and the iconic towers of Torres del Paine.